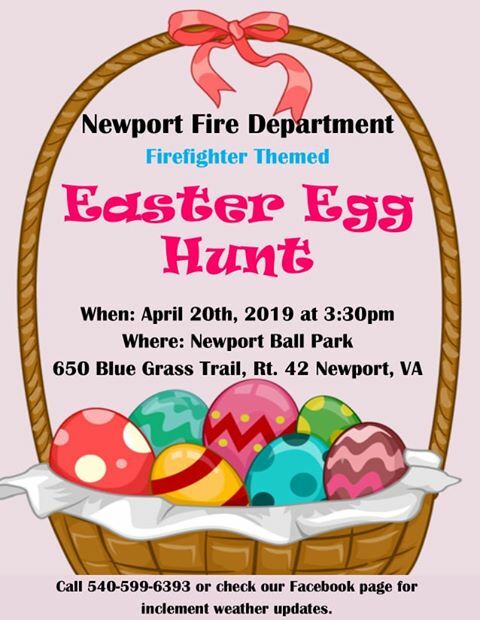 The Newport Fire Department presents a Firefighter Themed Easter Egg Hunt on Saturday, April 20, 2019 at the Newport Community Park. Kids can enjoy an Easter Egg Hunt using firefighter trucks, gear, equipment and more to hide the eggs around! To view the event flyer, visit: https://i.imgur.com/0RIUahg.jpg. The Newport Ball Park is located at 650 Blue Grass Trail in Newport, VA.
For more information and inclement weather updates, visit: https://www.facebook.com/NewportVolunteerFireDepartment/ or call 540-599-6393.